I’m just trying to record thoughts I’ve had over the last few years that I never took the time to write them down. The reason why I’m blogging a lot is because I actually have time! I’m trying to take advantage of this time while I can. Anyways, one topic that I have thought about is how I view sound as a deaf person. I’m going to just give a couple of general examples here. Maybe I’ll expand on it more down the road as I think of it. Growing up I always thought that everything that moved and/or I could feel made a sound. I’m not quite sure how I came to that conclusion when I couldn’t hear the noises, probably because I was either told or I saw how people reacted to it. So, what did that mean? In my mind anything that I couldn’t see or feel didn’t make a sound. I had the hardest time grasping the concept that someone could hear me from a different room when they couldn’t see what I was doing. For example, if I couldn’t see or feel someone in another room coughing then, to me, no one could hear it. I thought if I coughed in my room that people in another room wouldn’t be able to hear it. I did know that if I yelled from my room or if something crashed in my room that it made a sound loud enough for people to hear. I think that’s because it creates more of a vibration than some other sounds and I always got a reaction out of those sounds (parents or friends from another room would come in to check on me if they heard me yelling or if they heard something crashing). One example would be me jumping on my bed as a kid, a big no-no. I didn’t realize that even if the door was closed that noises could travel through the walls. I would wait until my parents were down at the other end of the house or downstairs in the family room to jump on my bed and I could NEVER understand how they knew when I was jumping. I thought they had extra eyeballs or magical parent powers. It wasn’t until a couple years later when I read a book about a boy who got caught jumping on his bed because his dad heard him. It then clicked that wow…sounds do travel through walls. Even to this day, I have a hard time remembering that even if a door is closed it doesn’t mean that sounds can’t travel out of the door. Sometimes when I would just hang out in my room I would get IMs from my roommates in their bedroom saying “bless you” when I sneezed. I almost always looked up thinking that the door was open and they saw me sneezing or something. I then had to remind myself that I experience sound in a different way than they do. The above question is probably the best way that I can describe how I experience sound compared to how hearing people experience it. If I can’t feel it or see it…does it make a noise? Visual and vibrations represent noise to me. I know that noises can travel through walls, hallways, etc. However, my first reaction is that if I can’t see it and I can’t feel it then it must not make a noise. If the doors are closed then how can a noise travel through the door if I can’t see or feel it? That was something I couldn’t quite understand growing up. Another example to try to clarify this a bit better. You remember how in elementary school if there was a class walking down the hallway, the teacher would usually close the door if it was too noisy. I would get distracted by kids walking down the hall, because I would see them. Seeing them walking down the hall was how I experienced the noises they were making. The more disorderly they were (out of line, flapping arms around, skipping, etc.) meant they were more visually distracting to me. The more visually distracting they were, the more noisy they were to me. So, when the teacher shut the door it was all quiet to me. I couldn’t see them therefore they weren’t making noises. It always threw me off when interpreters would tell me they could still hear kids out in the hallways when I had already forgotten about them because I could no longer see them. Hope everyone has a wonderful and safe holiday! Just thought I would write about some of the negative situations I have encountered in restaurants/fast food joints as a deaf person. The majority of my experiences eating out are good experiences. I have had waiters/waitresses wanting to learn a certain sign or they’ll practice their fingerspelling skills with me. Some of the things I mention in this post are what I refer to as deaf tendencies (for lack of a better term at this time) that we do joke about with each other. I also want to add that some people who are deaf prefer to order their food verbally, some gesture, some write it down, and others will point it out on the menu. I typically don’t order it verbally because I cannot tell how quietly or how loudly I’m talking in a noisy place. I always either whisper it or everyone in the place turns around because I’m talking too loudly (a bit embarrassing). –Immediately remove all condiments in breakable containers from the table, it’s possible they’ll get knocked off the table with our hands flying like crazy through the air. –Tell your waiters/waitresses that if they want a nice tip from us to please actually serve us. –Invest in deaf friendly tables which are round tables. We love round tables, because we can see everyone all at once. Rectangle tables are okay, but avoid seating us at the bar when possible. Bars are the most unfriendly deaf tables possible. If I’m sitting between 2 people who are having a conversation at a bar, I’m going to get whiplash from looking back and forth between them while following their conversation. It’s almost like being the poor person in the middle in a keep away game. –If your waiters/waitresses/hosts are going to mock us signing have them do it where we can’t see them. That’s a sure way to lose any tips. –Most groups may only come in for an hour, brace yourself, we will be there for 3 hours. It’s not often we get to hang out with people without having to deal with communication barriers. Oh yes, we go by DST (Deaf Standard Time) which has about a 2 hour delay compared to the rest of the population. 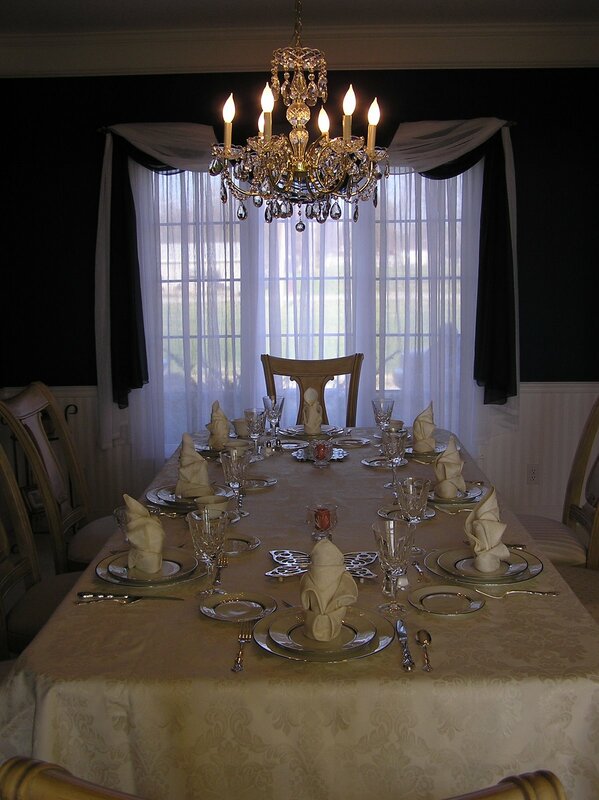 –Your centerpieces are very lovely but they will immediately get put on another table or on the floor. We can’t really see through your beautiful centerpieces while signing with each other. –Have a pail of water and towel nearby. There’s a good chance a glass of water/pop will get knocked over while someone’s telling a dramatic story. –We may be deaf, but that doesn’t mean we’re quiet. I can guarantee you that we’ll be the loudest table in your restaurant. We like to hit the table to get each other’s attention and to make a point when telling an intense story. There will also be oodles of blackberries and sidekicks vibrating every 5-10 minutes. –We’re not there for your entertainment. We don’t like being gawked at and gossiped about. Don’t huddle up into groups and stare at us for 20 minutes nonstop. –I’m not trying to steal your food, I’m just checking to see if it’s mine. I can’t hear them call the numbers/names out. Please don’t give me a dirty look and yell at me…I’m somewhat a picky eater and I’m sure I won’t want your food. –When I ask for a piece of paper and pen to write my order down, don’t go and get your fellow co-employer and supervisor for backup. It’s really not necessary to have 3 people waste 10 minutes just to take one order. –I know you’re trying to be helpful, but we can’t read Braille. –If I call to place an order do not hang up on me the first time, second time, or third time. If you actually don’t hang up, remember the relay operator will let me know everything they can hear on your end including unkind jokes/comments about my call in the background. –I see you asking everyone else if they want a medium, large, or extra-large order. Why do you assume that I want a specific size without asking me? I may actually have an opinion on which size I prefer to order. –There’s a reason why the drive-through was invented and I would like to take advantage of that reason. If I pull up to a drive-through and you refuse to take my order without me having to go inside then you’re going to lose a customer. –When I hold up 7 fingers and point to the combo menu, that means I want combo #7 not combo #3. It would be nice if your employers took a crash course in how to count fingers. –Relax. We won’t bite, I promise. We’re not as scary or intimating as we may look. 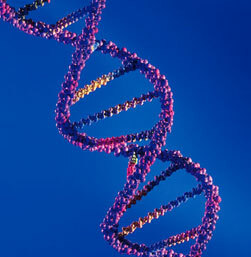 What is Genetic Counseling (GC)? That’s a question us GC people get often. Just to make sure we’re all on the same page I’m going to paste and copy NSGC’s (National Society of Genetic Counselors) definition here. I’ll probably elaborate on it more in future posts. * Interpretation of family and medical histories to assess the chance of disease occurrence or recurrence. * Education about inheritance, testing, management, prevention, resources and research. Anyways, why did I choose to go into genetic counseling? I’ve always been interested in science and took a genetics class my junior year in high school. It wasn’t an easy class, but I loved it. We didn’t have textbooks, instead the teacher used current events to teach us about genetics (the best way to teach). I found out from one of my high school interpreters a few weeks ago that this teacher passed away from cancer over the summer I was disappointed because I always wanted to tell him that I ended up in the genetics field. Anyways, when I graduated from high school I still hadn’t decided on what I wanted to do when I “grew up.” I could not decide between genetics, education, or psychology. I decided to just start working towards my B.S. in Genetics just because I had to pick a degree. I figured that out of those 3 possible careers I might as well as pick the one that would be the more challenging one for me. I’m not saying that the other 2 careers are not challenging, they are in their own ways. I’m just saying that out of those 3 careers, genetics was the more challenging one for me. Anyways, I had it in my twisted way of thinking that it would be much easier to start off with the more difficult degree and if I changed my mind down the path…it would be easier to switch from a more difficult degree to a less difficult degree than switching from a less difficult degree to a more difficult degree. I also took a few psychology classes and enjoyed them. I worked at a daycare and enjoyed that also. Time went along and I could not decide what I wanted to do, I put off officially declaring my degree for as long as I could (until either the last semester of my junior year or first semester of my senior year when we were supposed to declare it by our junior year). Over a period of 4 years I tried to take into consideration which career would I be more likely to get a job as a deaf person? One thing I did consider and many people pushed me to consider was to work in a lab. That sounded like a great idea to me since I liked science and it wouldn’t require much verbal communication with hearing people within the lab. I tried working in 4 different labs and hated it. 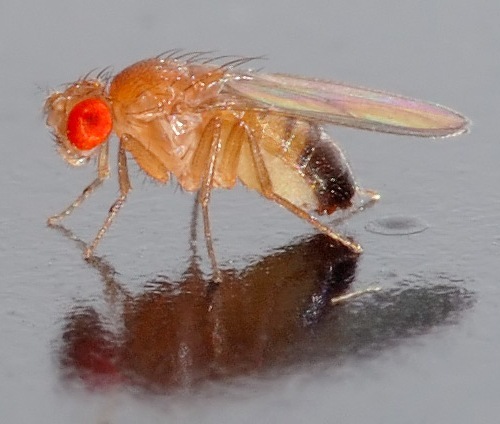 I hated sitting in the same spot all day, I hated not interacting with a living and breathing object aside from drosophilas (aka fruit flies). You can’t hold a conversation or interact with dorsophilas. I kept trying to convince myself that I just needed to find the right lab and the right project. I worked in 4 different labs and found out that I just did not have the attention span or patience to work in a lab. Wow, the eyes are a bit creepy in this picture! Remember, this is the person who actually tried to make a pumpkin pie with 2.5 cups of salt. I somehow managed to read “1/2 teaspoon” as 2.5 cups. I even reread the directions 3 times because I thought 2.5 cups was a bit much. Turns out I combined 2 lines of instructions into 1 sentence. I can be very detailed and very good at following directions except when it comes to these kind of directions. This is also the person who managed to drop a PCR gel (nongenetic people-you basically amplify DNA samples on these) on her bare foot the one time she wore flip-flops to lab (in my defense I had left to let an experiment run for several hours and changed into flip-flops. I just had to take the gel out and take a picture of it, that’s all). 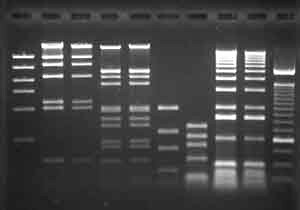 I also managed to have a little crisis when making gel for a PCR. I had put the liquid mixture into a beaker and put the beaker on a stirring plate while it was too hot….liquid flew out of the beaker EVERYWHERE and solidified EVERYWHERE. Oh yea, I also accidentally set a lab bench on fire (thankfully, I wasn’t the only on in our lab who did that!). Anyways, I kept forcing myself to try the whole lab experience because it seemed so perfect in terms of communicating with hearing co-employers and it would be easier to get hired as a deaf person. I wouldn’t mind working in a lab part-time but could not handle working in a lab full-time. During my whole 4 years of undergraduate, I kept trying to talk myself out of becoming a genetic counselor. How would I get a job in a field that requires so much verbal communication? I could never fully talk myself out of it and I kept coming back to it. I finally realized that I needed to stop trying to force myself to fit into something and choose something that fit me even if it may not seem like the most practical idea at that time. What is it about genetic counseling that I enjoy so much? I love the balance of interacting with people and research/independent work. I love how it combines more than just one disciplinary (genetics, psychology, education, etc.). I enjoy the non-tradition part of genetic counseling where I can branch out into other fields such as bioethics, public health, etc. I enjoy educating people and learning from them (it’s a 2-way process). There’s always something new to learn, it keeps me on my toes. It’s a field where you truly have to have a passion for learning. I enjoy interacting with a diverse population. I like being able to help people make informed decisions. It’s a challenging and a rewarding field. Deaf Adventures #4: Are You Deaf? Ok, so every once in a while I will have people come up to me and ask if I’m deaf. Usually they turn out to be ASL students and want to practice their sign language skills or they’re deaf themselves. Which is great. During my time in NYC I had a few random people come up to me and ask if I was deaf for no apparent reason. One day I took the subway into the city and had gotten off at a stop. I was walking upstairs while a guy was walking downstairs. It wasn’t busy and was just the 2 of us at that time. My hair was also down and he couldn’t see my hearing aids. I wasn’t doing anything to suggest that I was deaf. It’s not like I walked around the city signing to myself. 😉 He didn’t make eye contact or anything with me. Right after we passed each other on the stairs, he tapped me on my shoulder. When I turned around, he verbally asked if I was deaf. When I nodded my head “yes,” he just turned back around and kept walking down the steps. Another example was at a NSGC conference (not this year’s conference) where someone was watching me and Ashley signing. She walked up to me and signed “Are you deaf?” I replied, “yeah.” Then she just turned away and walked away. And even to this day it still bugs me who she was! It’s one thing to come up to me and strike up a conversation with me after asking if I’m deaf. It’s another thing to just randomly walk up to me and ask if I’m deaf and then leave me hanging. Maybe it’s just me, but I find it a bit odd. Sarah reminded me of this story. It’s a pretty short story because I don’t remember all the details. Sarah, you may need to jump in here and correct me or make additions. Sarah (one of my roomies at that time) and I had gone to the laundromat to do some laundry (obviously). Some random woman saw us signing and walked up to us. She started telling us about her niece/nephew or someone she knew who had just gotten a CI. She was talking about how amazing it was (although I’m pretty sure she was ignorant about it and was one of those people who view CIs as a “cure”), then she started talking about how I NEEDED to get one. At that point I gave up on trying to lip-read her, because I don’t exactly like when strangers walk up to me and tell me that I need to be “fixed.” Or when they try to give “friendly” advice and have no idea what they’re talking about. Luckily for me, I had to go and get my clothes out of the washer. Unluckily for Sarah, she was stuck talking to this lady for quite a bit while I moved my clothes from the dryer to the washer. Just wanted to let everyone know that I’m enjoying all of your comments. I’m trying to figure out if there’s a way to reply to comments directly (anyone know?). I do hope that when people read my entries that they also read other people’s comments. A lot of the comments have been great to read and I want others to read them too! 🙂 I’m learning stuff from you all! Edit: I might have figured it out, so I’m going to reply to your comments. If you don’t get a notification saying that I replied….please let me know.